Yad Vashem has fired an instructor who compared the trauma of Jewish Holocaust survivors with the trauma experienced by the Palestinian people in Israel’s War of Independence. Itamar Shapira, 29, of Jerusalem, was fired before Passover from his job as a docent at the Holocaust Martyrs’ and Heroes’ Remembrance Authority, after a teacher with a group of yeshiva students from Efrat made a complaint. Shapira had worked at Yad Vashem for three and a half years. This is the first time that Yad Vashem has fired a guide over political differences, an institution official said Wednesday. Shapira confirmed, in a telephone conversation with Haaretz, that he had spoken to visitors about the 1948 massacre at Deir Yassin. He said he did so because the ruins of the Arab village, today a part of Jerusalem’s Givat Shaul neighborhood, can be seen as one leaves Yad Vashem. Yad Vashem asserts that the Holocaust and Jewish suffering cannot be equated to anything else. Although many memorials exist for Jews, not even one exists at Deir Yassin, the symbol of Palestinian ethnic cleansing by the Isrealis. Deir Yassin Remembered was established to build a truth and reconciliation center at Deir Yassin. Please make a donation to Deir Yassin Remembered, a charitable and educational not-for-profit 501(c)(3) organization. 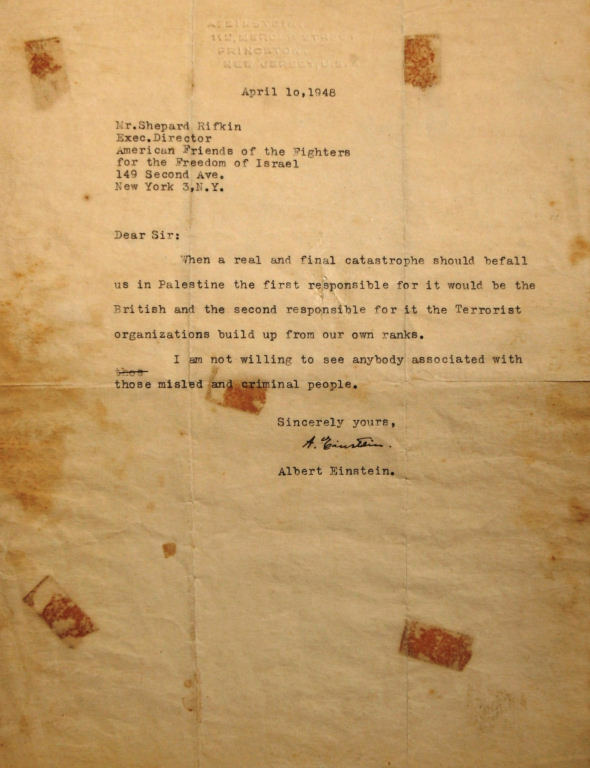 On his embossed letterhead, on April 10th, the day after the infamous massacre of Arabs at Deir Yassin, Einstein replied to calls from the Stern Gang representative for American money for arms to drive out the Arabs and help create a Jewish state and called the Stern Gang terrorists and misled criminals.